Citation: C N Trueman "The Battle of Guadalcanal"
The Battle of Guadalcanal took place in 1942 when the US Marines landed on August 7th. The landing at Guadalcanal was unopposed – but it took the Americans six months to defeat the Japanese in what was to turn into a classic battle of attrition. The Japanese defeat at the Battle of Midway had forced planners in the Imperial Army to reconsider their plans of expansion and to concentrate their forces on consolidating the territory that they had captured. The victory at Midway was also a turning point for the Americans as after this battle, they could think in terms of re-capturing taken Pacific islands – the first confrontation was to be at Guadalcanal. Guadalcanal is part of the Solomon Islands which lie to the north-eastern approaches of Australia. Though it is a humid and jungle-covered tropical island its position made it strategically important for both sides in the Pacific War. If the Japanese captured the island, they could cut off the sea route between Australia and America. If the Americans controlled the island, they would be better able to protect Australia from Japanese invasion and they could also protect the Allied build-up in Australia that would act as a springboard for a major assault on the Japanese. Hence the importance of the island. In Japan, they were divided thoughts as to the importance of the island. Many senior army figures believed that Japan should consolidate what it had and that the army itself was already over-stretched policing its vast empire. The hierarchy in the Japanese Navy disagreed. They believed that any halt to an advance would be seen as a sign of weakness that the Americans would exploit. While the Japanese appeared invincible on the advance, American confidence had to be diluted – so they argued. The Japanese Navy won the argument and the Imperial General Headquarters ordered an attack on the Solomon Islands with the view to establishing naval and army bases there. By the end of May 1942, the Japanese had landed men at Guadalcanal. Islands around Australia had been ‘dotted’ with men from the Australian coast watching team. To begin with, the reports from Guadalcanal seemed innocent enough as the Japanese seemed more interested in the cattle on the island than anything else. However, reports came back that an airfield was being built on the island – at Lunga plantation, probably the only point on the island that could sustain an airfield. By the end of June, there were an estimated 3,000 Japanese soldiers on the island. An up-and-running airfield on Guadalcanal would have been a major threat to the Americans in the region. The head of all US naval forces, Admiral Ernest King, wanted a full-scale attack on Guadalcanal to off-set this threat. Despite the Roosevelt–Churchill directive that gave the European war zone priority, the Joint Chiefs-of-Staff in Washington gave the go-ahead for the first American offensive campaign since Pearl Harbour in December 1941. King’s plan seemed simple enough. The 1st US Marine Division would land in Guadalcanal and secure a beach head to allow other US forces to land. However, the 1st US Marine Division, commanded by Major-General Alexander Vandegrift, had many men in it who had no combat experience. Vandegrift was told that his men would get time to train once they were in the Pacific as opposed to their base in North Carolina. However, by the end of June, half his division had still not arrived in the war zone and the date for the attack was just 5 weeks away. The naval force that was to accompany the 1st US Marines had also not operated together before and had little experience of amphibious landings. The whole force was also lacking in reliable maps, tide charts etc. Those that were used were found to be lacking in the most basic of details. The naval force had no charts for underwater hazards so they could not calculate how far inshore they could take a ship. To undo some of these issues, it was agreed on two occasions to put back the day of the attack – initially from August 1st to August 4th and then to August 7th. On August 7th, the Americans started their attack on Guadalcanal. Up to that date, the amphibious force was the most powerful ever assembled. Three carriers gave air support (the ‘Saratoga’, the ‘Wasp’ and the ‘Enterprise’) guarded by the battleship USS North Carolina and 24 other support ships. Five cruisers from America and Australia guarded the actual landing craft that gathered off of Tenaru on Guadalcanal. The Americans achieved complete tactical surprise. When the Marines landed on ‘Red Beach’, they expected major Japanese defences. They found nothing. A great number of men were landed with their supplies – in fact, so much equipment was landed that later in the day, there was general confusion on ‘Red Beach’ and inexperienced coxswains landed equipment wherever they could find a space. As the Americans advanced inland towards where the airfield was being built, they came across another major problem – the climate. The hot and humid jungle climate quickly took its toll on soldiers carrying heavy equipment. The climate also did a great deal to affect radios and radio communication between those advancing inland and those on the beach was problematic. Regardless of these issues, the Americans made no contact with the Japanese and for the first 24 hours there was no fighting on Guadalcanal. However, though the first 24 hours on Guadalcanal were relatively painless for the Americans, this was not so for the Marines who landed at nearby islands that lay to the north of Guadalcanal – Tulagi, Gavutu and Tanambogo. The Americans needed to control these as this would give them the opportunity to control the Ironbottom Sound and Nggela Channel that separated Guadalcanal from Florida Island, north of it. Here the Marines encountered fierce resistance and it took the US Marine Raiders 24 hours to eliminate the Japanese who had been based at Tulagi. This was a sign of what was to come. US paratroopers attacked Gavutu and met a similar response from the Japanese and it required fire from nearby naval ships to alleviate the problem. In some parts of the battles for these islands, the Americans took 20% casualties. The Americans arrived at the airfield on Guadalcanal late on August 8th. Once again, there were no Japanese there as they had fled into the jungle. The news that the Marines had reached the airfield was greeted with joy in Washington and Canberra. But this joy was shattered on the night of August 8th/9th when a Japanese cruiser force attacked the Allied naval force at Guadalcanal and forced it to withdraw. The Marines on Guadalcanal were on their own. Though the landing of equipment had been chaotic at times, equipment had been landed. In this sense, Vandegrift’s men were not in a hopeless situation – andVandegrift hoped that planes could land at the airfield that they now controlled. However, vital equipment such as barbed wire to defend his base, anti-personnel mines etc had not been landed in quantity. The Marines were in a difficult position. There were Japanese on Guadalcanal and their tenacity and fighting skills had already been seen in Tulagi, Gavutu and Tanambogo. The Japanese Navy controlled the sea around Guadalcanal and frequently fired on the Marines. The Japanese air force bombed the airfield runway. However, Vandergrift did have one good piece of luck – the Japanese had left a number of very useful vehicles which the Marines used to repair the runway. Their work was rewarded on August 20th when 19 Wildcat fighters and 12 Dauntless bombers landed at the airfield – now known as Henderson airfield. The Marines now prepared themselves for the expected all out Japanese attack on their positions. Radio Tokyo had made little secret of what the army planned to do and referred to the Marines there as “insects”. The Japanese had landed men on Guadalcanal on August 18th. A regiment led by Colonel Ichiki and a special naval landing force were assigned the task of defeating the Marines. Ichiki. He had been told to expect more troops to support him but such was Ichiki’s views on the Marines (one shared by many Japanese officer) that he believed that his men were more than a match for the Marines. He decided to attack on August 21st. Ichiki ordered a simple bayonet attack on the American positions. Carefully placed machine gun posts meant that many Japanese were killed. Ichiki ordered his men to withdraw but Vandergrift had ordered one of his reserve battalions to encircle the Japanese. In what became known as the ‘Battle of Tenaru’, the Marines slowly pushed the Japanese back to the sea. Ichiki’s men were surrounded on three sides with the sea on the fourth side. It was here that the Americans first found out that the Japanese did not surrender and that they were willing to die for the emperor. Using the planes at Henderson and some tanks that had been landed, the Marines killed many Japanese. Only a handful got away and moved east down the coast to safety at Taivu. Here, Ichiki committed ritual suicide – such was the defeat he and his men had experienced. Despite this triumph, Vandegrift knew that another stronger Japanese force would soon be landing on Guadalcanal – the men that Ichiki had not waited for; the XXXVth Brigade. The Americans had one major advantage over the Japanese – they had to be transported by sea and the ships transporting these men were open to attack from the American planes based at Henderson airfield. To get around this problem, the Japanese moved their men at night via fast-moving destroyers in so-called ‘rat runs’. By doing this the Japanese could all but escape American fire and they succeeded in landing a large quantity of men to the east and west of the American position at Henderson. Vandegrift decided to do what he could to disrupt the Japanese and he sent a party of Marine Raiders to Taivu. They found few personnel there but they did find out that the Japanese had already moved into the jungle and that an attack on the Americans would not be too far into the future. The American position at Henderson meant that one side of their defensive perimeter was bound by the sea. Vandegrift concluded that the only way the Japanese could attack his position was from the south of the island. The attack began on September 12th. Japanese bombers attacked US positions to the south of the airfield and as night fell, Japanese destroyers and a cruiser shelled the same positions. At least for Vandegrift, it confirmed that an attack would come from the south. The Japanese infantry attacked positions to the south of Henderson. However, the march through the jungle had taken its toll on General Kawaguchi’s men and they were exhausted. The jungle had also fouled up his communications. The assault on September 12th was a failure and the Japanese had to re-new their attack the following day. 2,000 Japanese soldiers attacked the American lines but well placed US machine guns and artillery took their toll. The Japanese made two other attempts to attack the Marines and on one occasion got to within 1000 meters of Henderson airfield. However, their casualty figures were mounting. By the end of the night, Kawaguchi had lost 1,200 men killed or wounded. The Marines and paratroopers had also taken heavy casualties with 446 being killed or wounded out of just over 1000 men. Tokyo ordered a new unit of men to the area – the XXXVIII Brigade – veterans of the capture of Honk Kong – and ordered that all resources in the region had to be directed at taking Guadalcanal. 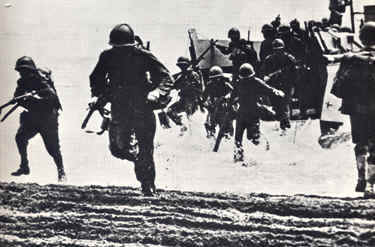 In all, 20,000 Japanese troops were moved to Guadalcanal. The US Marines also got reinforcements which gave Vandegrift command over 23,000 men, though it is thought that one-third of these men were unfit for combat due to a variety of diseases, such as dysentery and exposure. The US air presence at Henderson was also improved. On October 23rd, 5,600 Japanese soldiers attacked US positions on the east of the defensive zone. Pin point artillery fire ensured the failure of this attack. On October 24th, the Japanese launched a major attack from the south with 7,000 men. At one stage a small number of Japanese troops got inside the defensive perimeter but fierce fighting drove them back. When Kawaguchi ordered a withdrawal, he had lost 3,500 men – 50% of the force that had attacked. Why had both attacks failed? The American positions in the defensive perimeter had been expertly sited. However, the Japanese had failed to take into account the sheer difficulties they would face by going through a tropical jungle to attack the Americans. Frequently, Kawaguchi’s men were too fatigued to effectively fight and the terrain had forced them to leave mortar and artillery behind. Therefore, any attack on the American lines was done by an old-fashioned infantry charge against positions that were equipped with mortar and artillery. The terrain had also done a great deal to hinder Japanese communications. With the Japanese in disarray, Vandegrift decided the time was ripe for the Americans to go on the offensive as opposed to being cooped in a defensive role. However, the US 1st Marine Division was in no state to do this and in November 1942, it was replaced by 25th Infantry Division and the US 2nd Marine Division. The Japanese hierarchy in Tokyo refused to admit defeat and ordered yet more men to Guadalcanal. In mid-November 1942, planes from Henderson attacked a convoy of ships bringing Japanese reinforcements to Guadalcanal. Of eleven transport ships, six were sunk, one was severely damaged and four had to be beached. Only 2,000 men ever reached Guadalcanal – but few had any equipment as this had been lost at sea. On December 1942, the emperor ordered a withdrawal from Guadalcanal. This withdrawal took place from January to February 1943 and the Americans learned that even in defeat that the Japanese were a force to be reckoned with. 11,000 Japanese soldiers were taken off the island in the so-called ‘Tokyo Night Express’. The American victory at Guadalcanal ensured that Australia was safe from a Japanese invasion while the sea route from Australia to America was also protected. The role played by the US 1st Marine Division and its commander, Vandegrift, have gone down in Marine Corps history.